Introducing a new stylized brush tool for Final Cut Pro X by Pixel Film Studios. 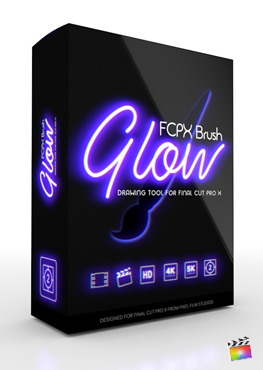 FCPX Brush Glow was designed exclusively for Final Cut Pro X and provides simplified brush controls as well as hot keys to quickly and effortlessly edit the canvas. The brush tool offers two modes to edit the canvas, Frame by Frame and Add to Subsequent frames. Create your hand drawn animation directly inside of Final Cut Pro. Your imagination is the only limitation when using FCPX Brush Glow. This plugin is not compatible with late 2013 Macbook models with Intel or AMD FirePro 300 graphic cards.